The primary reason we keep fowl is to maintain a non-chemical way to deal with the bug and fly problem that invariably comes with gardening and raising animals. Our free-range birds aggressively patrol our grounds searching high and low for bugs and especially anything as tasty as a fly larva. While they don't get every bug, they do a marvelous job of keeping the bug population in check - not to mention that they also provide us with free-range eggs and the occasional pot of chicken and dumplings. One of the key principles of sustainable agriculture is that the more diverse a system is, the more sustainable it is. 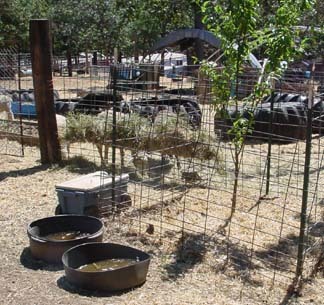 One expression of that principle involves keeping cows, goats and sheep on a given acreage instead of just one type of browser - since each animal prefers a different sort of graze, a mixed herd will put less pressure on the land than will the same weight of any one type alone, and the less stress, the more sustainable the practice is. We've found that for what we're doing, India runner ducks are the star performers, but we still maintain a diverse flock to some extent since each bird has its own niche to fill. Chickens, for example, are good at using their claws to break up clumps of manure, and peacocks are death on snakes. But nature is a two-way street, and just as our "tame" birds prey on the bugs, there are wild birds who are just as happy to prey on our flock. We don't mind the occasional tithe to nature, but there are times when we've to take action because some predator decided that Windward was easy pickings. For example, a few years back we had an owl decide to come in for a duck a night. It was sort of Windward's version of the reality TV program "Survivor" as each sundown the ducks got into a panic wondering who was going to get chosen that night. Usually ducks go their own way and aren't very amenable to being herded - but during the owl episode, they quickly became remarkably easy to get to go into their shelter for the night. Suddenly being locked up for the night seemed like a fine idea indeed. The birds available from commercial hatcheries are the product of incubators, with a result that the ability to lay a clutch of eggs and sit it out has been weakened. While we do have an incubator, we don't use it - preferring instead to insure that the birds we raise are the chicks of hens who are active brooders. That works well as far as it goes, but there's still a high natural attrition that thins out the hatchelings considerably. It's not uncommon for a free range hen to lose the majority of her chicks between hatching and the point where they're feathered out and on their own. That's where stewardship takes a hand - we scoop up the new born chicks and pop them into our brooder where they're safe and have ready access to food and water. 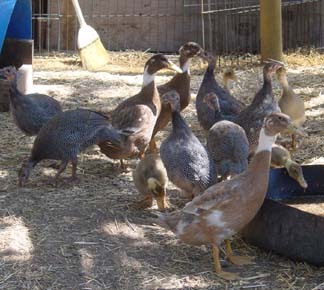 It's hard to reward a duck hen's fidelity in hatching out a brood by taking them away from her - and she goes to great lengths to tell you just what a low down so-and-so she thinks you are - but into the brooder they go. It's by insuring that nature's goal is achieved - in this case the production of more ducks - that the steward earns his dinner. 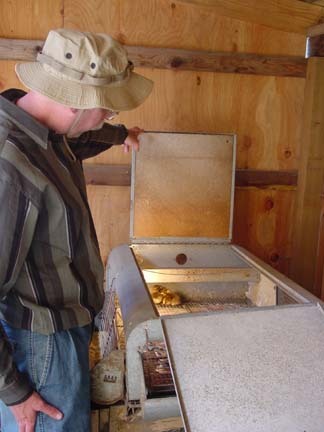 Our commercial-style brooder has a 40 watt light bulb in the back so the new born chicks can cluster under the bulb if they get cold in the night, or move a couple of feet away to the other end of the brooder if they get overly warm. It's remarkable how fast the little chicks grow when they have ready access to food and water, and in a couple of weeks they're banging their heads on the top of the brooder. That's when it's time to move them out to the tractor tire - in much the way a gardener moves plants germinated in the greenhouse to a cold frame before taking the last step and planting them in the garden outdoors. 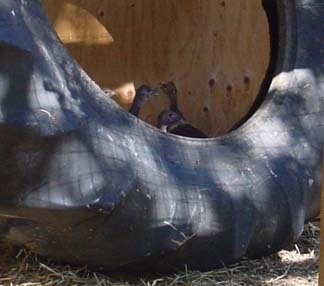 Once they've outgrown the tire, they're close enough to adults that it's time for them to start moving freely around the grounds venturing further from the tire each day as they become more bold - and running back to it when strangers with cameras approach. 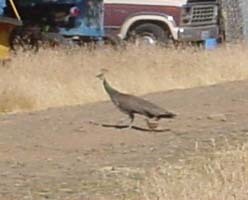 This year we've added guinea hens to our mix - they're traditionally a southern bird that is rarely seen in the Pacific-Northwest, but when the local feed store had some left over from a special order, I thought it would be interesting to see how they fit in with our other fowl. We put the seven guineas chicks in with three older ducklings, and they seemed to get along just fine. Later, we added another four ducklings, and by now they've grown into their own special flock. We'll be looking to see if they segregate once they get older, or if this motley flock will keep together. While we're happy to flirt with other types of fowl, ducks are likely to remain as our primary fowl. They're agressive bug catchers, good at scarfing up weeds as they germinate and prolific egg layers - all without doing real damage to the garden. That compares with chickens who can get in and claw up the garden doing real damage. Indeed, it was when chickens completely destroyed one of our early strawberry patches that we started to investigate alternatives. The "problem" with ducks is that they require more water than chickens do. They need to splash around and muck their food - a process which irritates the sheep considerably if the only water available to the ducks is the water set out for the ruminants. We solved that problem by setting out basins of water near our fruit trees. 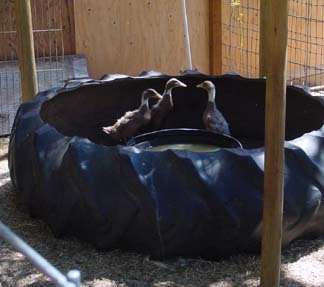 The ducks enjoy themselves immensely and leave the water quite "enriched." Since we need to water the fruit trees anyway, allowing the ducks to have first use of it benefits both the ducks and the trees - good sustainable practice at no extra cost.